When the last child left the nest recently my soon-to-be guest room still had unwanted furniture, storage items and six large bags full of gently worn (if worn at all) clothing. He did ask if we would donate the clothes so my husband arranged for a pickup on Monday. I was glad it was a few days away so we could use the opportunity to work on adding to the donation. 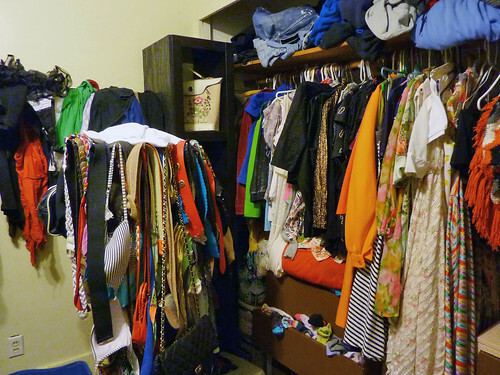 I have been thinking about cleaning my closet after J. Money’s challenge last week. That’s because the closet stores a lot of items I don’t use or wear anymore and it’s become quite messy (to the point that I would be embarrassed for you to see it, so no before photos!). The top of my closet is the storage area for backpacks, gym bags or any other type of non-suitcase bag. I have a hard time parting with any and somehow keep accumulating them. Since I only use a couple of the bags the rest are going. There are also two large bags of swag from past blogging conferences. These are all the items I thought were cool, but haven’t figured out what to do with them. If I don’t know a year later, it’s time to move on. Yes, I could have tried selling a lot of these items on Ebay or Craigslist, but I never will so why fool myself? Father Joe’s Villages are a favorite local charity that I am happy to support. It’s a win-win. I get an emptier, neater closet and they get the value of the donated items. What do you do with things you no longer want or need? I have been purging big time. I’ve made over $100 so far and have more listed. I love your Lune about the swag bags. I have some that just sit there. I should just get rid of them. Lol. It is easier to just donate versus selling it. I opt to donate. Kids never take their stuff when they move out. I chased my son for months to clean out his room and then finally I cleaned it out myself. By the time I was done, the remains of his entire room fit in a single box. I got rid of the rest. I have called the local crisis pregnancy center and they have come to my house to pick up clothing and baby clothes donations. Saved me gas $$$ and time! This post really hit home with me. Our kids have all left home & we are left with their stuff. We’ve been taking items to them every time we visit, but much of it they don’t want. Its easiest to take it to charity in hopes that it helps others. As you say, it’s so nice to get room in those closets! What a guest room will emerge? Sweet deal! Goodwill has a drop off center right by my house so my cast offs head that way because its convenient and close. I take a picture of all the items and price them out in an excel file so I have records for tax purposes (besides the blank receipts they give you). I probably won’t itemize because we don’t have much to write off right now, but taking a picture and figuring out how much everything actually costs and what its worth now makes for a nice reminder the next time I go shopping. I’m in the process of slowing going through things all throughout my home and trying to find a home for them before they get donated. A younger co-worker of mine is moving into her first real apartment so i’m giving her my old pot and pan set because I got a really nice new one for my birthday with a lifetime warranty. She was thrilled that I offered. Wow, what an amazing turnaround closet. I love to clean and organize. I just wish I could do it for a living but don’t know how to get started. Some time ago, a friend of mine share his mantra with me … whenever you bring an additional item into the house, you have to dispose of something that is at least the same size. I love following this because it does stop you from accumulating unwanted items. I always donate our items – there’s one organization I use, I can arrange a pick up online and they usually pick up within a few days. Super convenient. We tend to donate to a local charity not far away. I love the feeling that someone less fortunate can make use of the stuff. Sometime ago hubby and I downsized and we kept downsizing as the four now grown children have left home. So over the last 6 years I have been donating, donating, selling some and donating. I find it wonderfully uplifting to unload all the stuff of life. We now live in 480 sq ft. A far cry from the large house we raised the four in. Last Christmas since things we tight around the nation I made basket after basket full and posted for free on craigslist. I would include in each some food and some hygiene products (which I manage to collect through out the year using coupons and get for free) Everyone that came to collect seemed very appreciative, as I managed to put items together that they could use as Christmas gifts to those they loved. I hope to do it again this year as things seem harder for folks , I have been doing it every month since Christmas so I am not certain I will have as much to give this holiday season, but you never know. It seems to be the fish tail where the baskets just keep filling. To give the bread and fish to the hungry. This was not writen by me. I appreciate the plug for my blog but the post is not correct. Jenna, I took the URL out. I’ve never had good luck selling adult clothing. Those always seem to go to goodwill and/or “dress for success” charity. I do try to sell toys and kid’s stuff though. Most of that goes on craiglist because it’s so much easier than ebay.